We have a suite of software offerings catering to the Process Automation & Data Management needs of the Business Process Management industry. 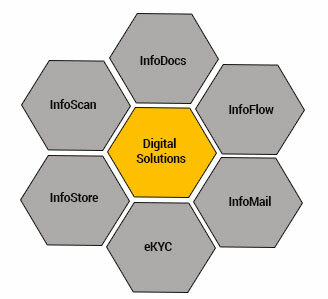 The Software solutions provide offerings to the Digitization lifecycle process with seamless integration with ERP systems & Interface scenarios. Speed to Market today is a key essence for a new Process Implementation in any industry. Writer Information strives to be a key enabler to Customers & Solution partners providing Software solutions with Configurable Implementation models & Flexible Deployment facilities. Customer solutions are analysed & implemented around a Rules driven architecture for easy Change Management & Testing control. Roles based access governed with User Controls & Concurrency rules discussed with the Customer. Seamless integration for Data & Images transfer with Customer portals & Storage locations; SSO enabled framework allows the convenience to customer users to avoid multi-logins. Security Certified & Validated applications for Network Testing, Penetration Testing & High Volume users database.